Driving north from Nice along the Var River Valley, Mont Vial (1550 m) is the first mountain top reaching over 1500 m.
The summit itself is not very pretty, being marred by telecom and other masts, but it offers great 360° views to high Mercantour mountains, and over the vast Moyen Pays. We started the hike from the village of Reveste-les-Roches (850 m) on a warm and fairly clear day in late November. There’s good parking by the D27 road just after the church, and signpost # 31 at our trailhead was just across the road. We climbed passing the last houses of the village to signpost #32, and continued along the vast south-eastern flank of Mont Vial. Given the steep incline of the mountain’s adret slope, the ascent was pretty easy in a terrain that varied from some screes to thin pine woods. The views from the ascending trail were unobstructed most of the time. The trail eventually circled around the eastern incline of the massif, with Var Valley 1000 m below us. It was the most impressive part of the ascent. We came to the northern side of Mont Vial where the forest was denser, and now in the shade, the temperature dropped. In fact, parts of the trail were slippery after previous night’s frost. At Col de Serse (1416 m), we came to a crossroads where we forked left to Mont Vial. We came directly to a narrow service road going to the installations on the summit (signpost #285). The highest point of the summit was about 300 m to the right (northwest). After lunch, we considered the alternatives. The original plan was to use the same trail back, but the icy parts of the trail would have been more difficult to negotiate when descending. 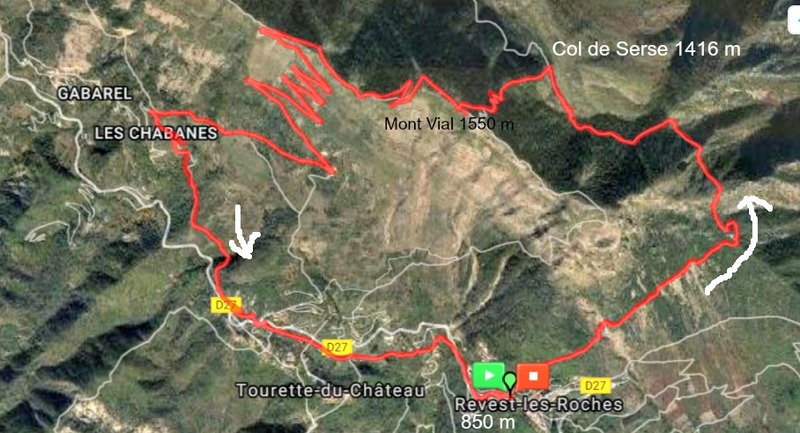 A longer trail would have continued along Créte du Vial northwest, then back to Reveste des Roches. We decided to take the service road that zigzagged down along the southern slope. By using the road we took a shortcut, and could enjoy the afternoon sun. We soon came to signpost #66 that had toppled and hence almost undetectable. Here, we forked left and followed the trail first to the village of Tourette-du-Château (signpost #43) and then to Reveste des Roches. This part of the trail was less marked and the local hiking map was essential.